The current version 0.9.0.8 "Oslo" is pretty stable. We will however release a new version codenamed "Madrid" shortly. The main purpose will be to provide more language packs in the main distribution. To all translators: please update your language files as much as possible for this release. The translation howto is here. Anyone feel free to start a new translation or update one that has not been updated in a while. For those of you updating directly on the CVS ( Ronh! ), please make sure that you work on the "v-0-9" stable branch and not on the main development branch. Only changes in the "v-0-9" branch will make it into the release! I’d like to submit flag images for en-IL. How should I submit them? Translating to Hebrew would probably entail redesigning the pages, since it goes from right to left, so I’ll leave that for some other time. Is English an official language for Israël ? Including flags for all countries is only a matter of resizing images. But I really would like to fdo this only for real locales with translation. Anyone can easily add his own flag without translation if he wants to. If you do make a translation to Hebrew, be assured we will work with you to make the app work with RTL display. 1) The flag will display properly when linked by other sites. 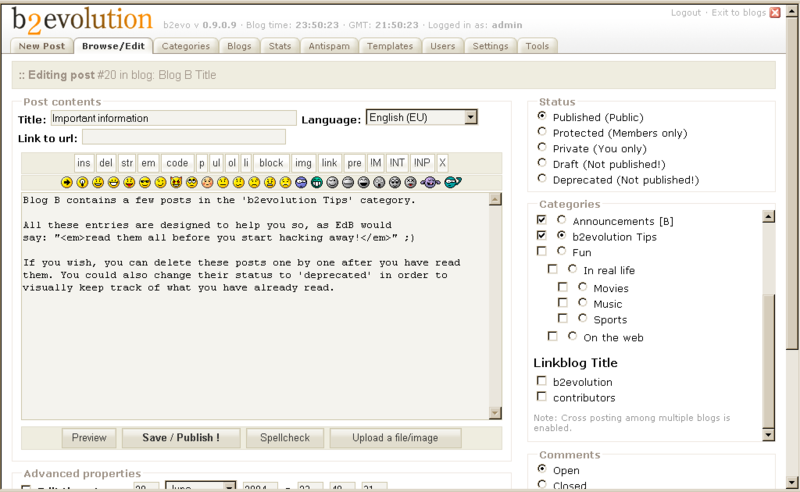 For instance, when I have a post from my blog cited on the b2evolution page, I get the ubiquitous question-mark flag. 2) Other people from these countries can start posting out of the box, without having to make their own flags. Even if I could make a Hebrew translation file, I’d still do my blog in English, since most of my readers don’t speak Hebrew. But I still want an Israeli flag showing up because I’m posting from Israel and not, e.g., the EU. I see your point, but the flags here are only a – admitedly poor – representation of the language/locale of the blog, not it’s country of origin. Any suggestions for picturing internaltional English? And for a non standard locale name? en_I ? en_INT ? I think when you see a flag next to a post you assume that the post was written by a citizen of that country, which is probably why there is an EU flag. So maybe these two things should be separated. As it stands now, adding flags for all countries to the image folder shouldn’t be controversial, and that would solve the question-mark flag problem. I’d be glad to discuss this with you further. Yes American and British English are different. Btw, English is not an official language in Israel, but all the street signs are in English, Hebrew and Arabic, so it’s all but official. I am not going to argue here. Flags are a poor way of representing locales. I have said it already. But 80% of the people like the flags, so we do it for them on the site. Period. It’s not an issue about pictures but about locales. The pictures are useless until there is a locale to reference them. And again, Yes, adding 250 additional phony locales for en_XX is controversial. I see your point about having to add all those fake locales. I still think that those 80% of people who want flags, want them to represent who they are, not which language their blog is in. Would a Japanese writing to an English-speaking audience want an American flag next to his post or a Japanese flag? Anyways, changing this policy would probably require a bit of a redesign, even if we agreed on that point, so for now should I send you the en_IL locale? How do I do that? Josh, you do not seem to understand: the flags in b2evolution are used the same way websites have flags to go to the English version or any other translated version. All those sites do use an US or an UK flag for the English version, even if the site is in another country. Accept that those 80% think different from you and me. Yes there are hundreds of people posting with american flags all over the world and they’re happy about it. I personally don’t like the flag analogy that much either. It is confusing indeed. Anyway, you can send me the locale details by email. For those of you updating directly on the CVS ( Ronh! ;) ), please make sure that you work on the “v-0-9″ stable branch and not on the main development branch. The new look is . . . new. Reckon I’ll be okay with it, but I sort of liked the blue buttons. On the flag issue, how about (if it’s not already done) writing a HowTo for people to create their own “locally flagged English"? Basically it’s the flag source, dimension requirements, folders to upload to, and naming conventions, then the actual locale creation. That way anyone wanting their own can change their flag without having an actual translation. Francois, I really did understand the point about the locale, I just think most people would rather have the flag represent nationality and not locale. That would really be a new and separate feature, so it’s good that people can fake it by following your flags howto page. I vote for en_INT for International English and rainbow flag, like the rainbow-shirt in cycling. The flags should stay for language an not locale. I like being able to see a flag to know what language something is in before I waste the bandwidth loading a page in a language I can’t read. I understand wanting the flags for you can let people know what country your in, but knowing what language your post is in is more important. if u need, feel free to use it!